The 2013 NHL regular season was a shortened one due to the lockout. Despite the fact teams were limited to just 48 games, there were tons of interesting stories and statistics from the abbreviated schedule. Here are 70 facts and statistics that we thought were some of the most interesting, most prominent or most noteworthy from the recently completed regular season. These are presented in no particular order. Instead, they are just a collection of tidbits which you can store away in your brain for a rainy day. 1. Martin St. Louis led the NHL in points with 60, earning him the Art Ross Trophy. He did so with an EVEN plus/minus rating. By comparison, the last three winners were Evgeni Malkin (+18), Daniel Sedin (+30) and Henrik Sedin (+35). 2. A total of 214 players failed to light the lamp this season. This total includes players which met the minimum requirement of suiting up for at least one NHL game. In other words, those of you reading this scored just as many goals as 214 NHL players. Congratulations! 3. Goaltender Martin Brodeur was credited with a goal this season. It was the third goal of his career. 4. Florida defensemen Brian Campbell and Erik Gudbranson share the dubious title of the worst plus/minus rating in the NHL. Both men were a (-22). 5. The Chicago Blackhawks earned more points in 48 games (77) than the Edmonton Oilers (74 points) and the Columbus Blue Jackets (65 points) earned in 82 games back in 2011-12. 6. The New York Islanders and the Minnesota Wild were the only teams that didn't allow a shorthanded goal this season. 7. Intermissions went from 17 minutes to 18 minutes. You have one additional minute to hit the bathroom or to get nachos and broadcasters have a chance to show more advertisements. 8. The Colorado Avalanche won just four games on the road in 24 attempts. 9. New Jersey scored 11 shorthanded goals. This is a remarkable stat considering NJ finished 28th in the league in scoring. 10. Alex Ovechkin fired 220 shots in 48 games, an average of roughly 4.5 shots a game. 11. Tampa Bay celebrated their 20th year in the NHL. The Lightning were founded in 1992. 12. The NHL approved new alignment, meaning the 2013 season was the last time we'd see Detroit and Columbus in the West. Winnipeg will shift over to the West from the East. 13. Alexei Kovalev announced his retirement on March 21st. He appeared in 14 games for the Florida Panthers this season. 14. Only six teams scored on penalty shots this season. New Jersey and Florida each tallied two penalty shot goals while St. Louis, Vancouver, Nashville and Boston each tallied one. 15. The New York Rangers and the Chicago Blackhawks were the most disciplined teams this season. Each team had 444 penalty minutes, the fewest in the league. 16. Scott Gomez scored a goal. Seriously. In fact, he scored two goals with San Jose after having his old contract bought out by Montreal. Sadly, the site DidGomezScore.com met its demise this season. RIP, awesome site. 17. Speaking of old contracts that were bought out, the New York Rangers removed Wade Redden's ugly deal from their books. 18. Redden then joined the St. Louis Blues and skated in his 1,000th NHL game. 19. The Tampa Bay Lightning turned on the biggest scoreboard in the NHL. Add in the fact some enormous Tesla coils supply real lightning and you have a tremendous atmosphere for a game. 20. The New York Islanders traded for Tim Thomas. This was a pretty interesting deal as Thomas had no intention of playing and the Islanders had no intention of using him this season. The move was made purely to push the Islanders above the salary cap floor. 21. Martin Brodeur won his 666th NHL game. He ended with 669, but it was appropriate to see the New Jersey Devil hit such an iconic number. 22. Viktor Fasth made his NHL debut at age 30. He then went on to go 8-1-0 with a 1.93 GAA in February. The goaltender went on to end the year with a 15-6-2 mark with a 2.18 GAA. Not bad for a goaltender no one had heard of prior to the season. 23. Ray Emery became the first goaltender in NHL history to start the year with 10 consecutive victories. He ended up pushing his streak to 12 games before losing his first game of the year on March 29th against Anaheim. 24. Chicago started 2013 by earning at least a point in 24 consecutive games (21-0-3). 25. Nail Yakupov, the first overall pick in the 2012 NHL Draft, made his NHL debut. He appeared in all 48 games for the Oilers this year (17 goals and 14 assists for 31 total points). 26. There was an online movement to place Nashville's Brandon Yip on the cover of NHL 14. Who? Exactly. The movement was unsuccessful. 27. Milan Hejduk played in his 1,000th game. He has spent his entire career (1998-99 through the present) with Colorado. 28. Mike Milbury berated Alex Ovechkin, telling him to act like a man. Milbury saying something moronic is a fact nearly every time the man makes an appearance. 29. Ovechkin responded to Milbury by calling out his failures as a GM. Maybe not the most manly way to respond, but Ovechkin's comments were pretty accurate. 30. Ovechkin was the top scorer in the NHL with 32 goals. He scored 24 in the final two months of the year, effectively silencing his critics. 31. Colton Orr accumulated 155 penalty minutes in 44 games. His total in the abbreviated season would have ranked 8th in 2011-12. 32. A total of 77 different NHL players scored a short-handed goal this season. 33. Matt Martin of the Islanders had the most hits in the NHL for the second consecutive season. He had 234 in 2013 and 374 in 2011-12. 34. Philadelphia's Claude Giroux won 644 faceoffs, the most of any player in the NHL. 35. Giroux took 40.7% of Philadelphia's draws. 36. The Los Angeles Kings missed the net with 656 shots, the most of any team in the NHL. This averages out to roughly 13.6 shots a game that flew high or wide. 37. The Kings blocked the fewest shots in the league (511). 38. As a team, the New York Rangers won exactly 1,410 faceoffs and lost exactly 1,410 faceoffs. It's pretty easy to figure out their faceoff percentage. 39. When leading after 20 minutes the LA Kings lost just one time (15-1-0). 40. The Buffalo Sabres and the Colorado Avalanche both have the distinction of entering the second period with a lead just 10 times. 41. The Nashville Predators never won if they were trailing after 20 minutes (0-12-1). Every other team won at least one game after entering the second period with a deficit. 42. Patrick Kane and Jonathan Toews each took 11 shootout attempts. Kane converted six times, Toews converted five times. 43. Andy McDonald went 4-for-4 in the shootout. 44. Minnesota's Ryan Suter spent 1,309:25 minutes (almost 22 hours) on the ice in 2013, the most in the NHL. This translates to just over 27 minutes a game. It's safe to say in terms of pure workload he lived up to the first year of his 13-year, $98 million contract. Well, maybe not, but he at least worked hard. 45. Kris Letang and Mike Green each averaged 60 seconds per shift. The duo led the NHL in longest time on the ice per shift. 46. Toronto's Frazer McLaren had the shortest average shifts in the NHL of any player that appeared in more than 9 games. McLaren's average shift was 34 seconds. 47. 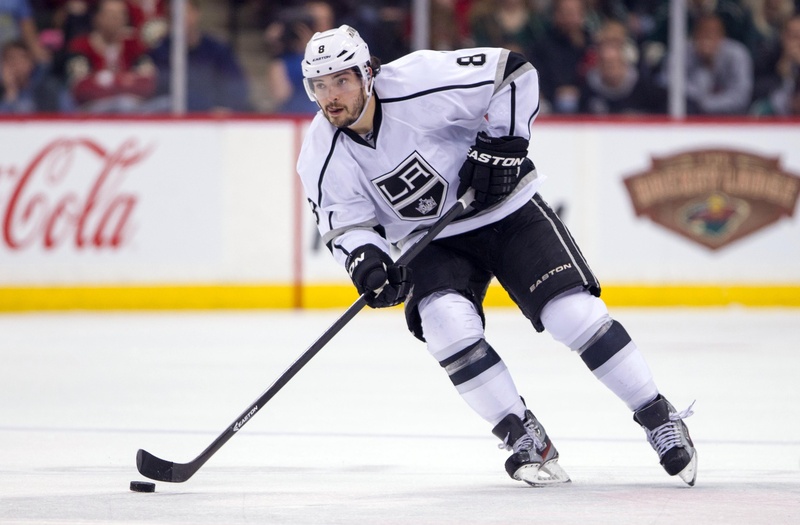 Drew Doughty was a +15 at home and a (-11) on the road. 48. Alex Tanguay had the highest shooting percentage of any player that skated in more than 25 games. In 40 games, Tanguay scored 11 times on 44 shots (25%). 49. Erik Karlsson and Alex Ovechkin each averaged 4.6 shots per game. Granted, Ovechkin sustained his over 48 games while Karlsson only maintained the rate over 17 games. Still, it goes to show you how impressive Karlsson's start to the season was. 50. Sidney Crosby finished four points off of the leading NHL scorer, Martin St. Louis, despite playing in 12 fewer games. 51. Crosby averaged 1.56 points-per-game, most in the NHL. Martin St. Louis was second with an average of 1.25. 52. Ryane Clowe: 0 goals on 65 shots with San Jose, 3 goals on 22 shots with the Rangers. 53. There were three goaltenders that appeared in at least 12 games that failed to record a shutout. Ottawa's Robin Lehner (12 appearances, 0 shutouts), Florida's Jose Theodore (15 appearances, 0 shutouts) and Colorado's Jean-Sebastien Giguere (18 appearances, 0 shutouts). 54. Craig Anderson posted a rather mediocre 12-9-2 record despite an NHL-leading 1.69 GAA. He stopped 637 of 677 shots he faced (.914%). 55. Ryan Miller was called on to stop 1,270 shots (he only saved 1,162). He also put his condo up for sale. We're not saying the two facts are related, but we might try and leave town too if our defense was letting that many shots get through. 56. Sergei Bobrovtree was born. Also known as Jay Onrait's plant. 57. Lindy Ruff was removed from his duties in Buffalo. He was hired in 1997. That's a crazy long time ago. 58. Brian Elliott's February: 0-4-1 with a 4.67 GAA. Elliott's March: 0-1-0 with a 4.18 GAA. After a brief conditioning stint in the AHL, Brian Elliott's April: 11-2-0 with a 1.28 GAA. Night and day. 59. 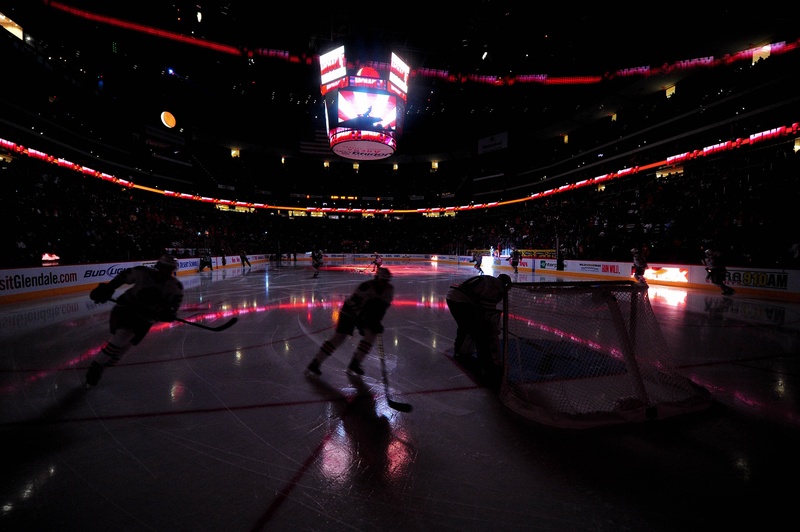 The Chicago Blackhawks had the highest average attendance at their home games (21,775). More on NHL attendance here. 60. Toronto earned a playoff spot for the first time in nine seasons. Their last appearance was two lockouts ago, back in 2003-04. 61. The Islanders earned a playoff spot for the first time in six seasons. Their last appearance was in 2006-07. 62. The Detroit Red Wings cut it close, but extended their playoff streak to 22 seasons. 63. The next longest streak behind Detroit belongs to San Jose (9 seasons). 64. 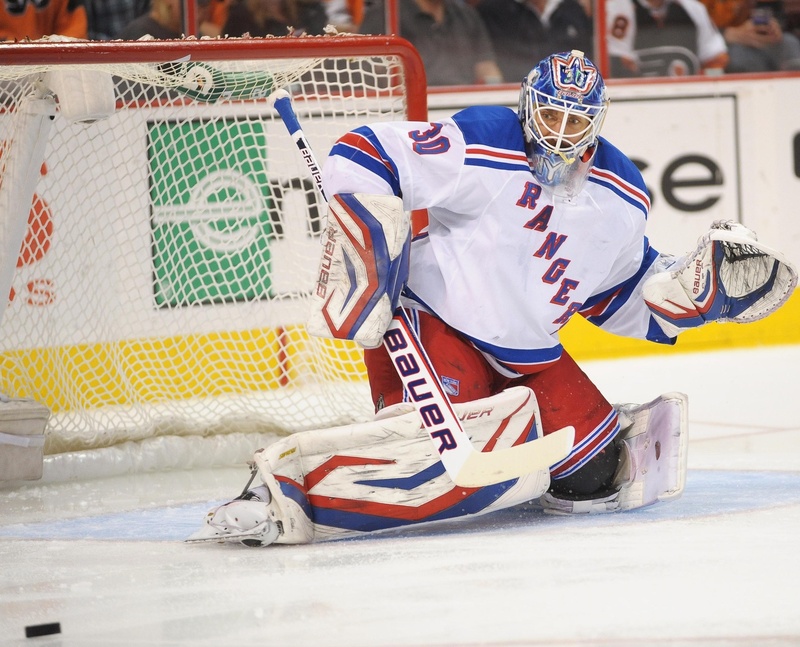 Henrik Lundqvist stopped 19 of the 25 shots he faced in the shootout. His save percentage of .760 is the highest of any goaltender that saw 10 or more shootout attempts. 65. Lundqvist also appeared in an ESPN ad with Swedish Chef from the Muppets. It was clearly his biggest and best highlight of the season. 66. Henrik Sedin finished 60.2% of his shifts with the puck in the offensive zone. 67. Colorado's Patrick Bordeleau received an average of 3.2 penalties per 60 minutes. This excludes coincidental or matching penalties. 68. Buffalo's Patrick Kaleta drew an average of 3.5 penalties per 60 minutes. Again, this excludes coincidental or matching penalties. Kaleta's rate is the highest of any player that appeared more than 10 games. 69. Kimmo Timonen's shots came at an average distance of 62.7 feet away from the net. In other words, almost all of his shots came from within a couple feet of the blueline. 70. NBC posted some pretty incredible regular season ratings. If you made it this far, congratulations! You're a dedicated reader here at PDL and we appreciate that. Have a fun or interesting fact/stat that we missed? Post it in the comments. Editor for The Comeback and Contributing Editor for Awful Announcing. Lover of hockey, soccer and all things pop culture. www.thecomeback.com/puckdrunklove is a hockey fan web site and is in no way affiliated with the National Hockey League or its Properties or Organizations. This site is for informational and entertainment purposes only. www.thecomeback.com/puckdrunklove is not an official web site for the National Hockey League. Copyright © 2016 www.thecomeback.com/puckdrunklove - All Rights Reserved - Trademarks used herein are property of their respective owners. thecomeback.com/PuckDrunkLove is part of the NESN digital network.